When I was a little girl I was a very eager, but very average, pupil at the Brenda Stevens School of Dance. Twice a week I would skip happily along to classes in tap, ballet and modern theatre dance. I, along with millions of other little girls (and boys!) would dream of being a ballerina and twirling in a beautiful pink tutu on stage. Now, every four years the dance school would put on a full school recital at a local theatre. There would be months of rehearsals and mounting excitement. I would have been around seven years old when our tap class number was to be the “sing a rainbow” song. There was seven of us in the class and we were arranged in a line in descending height order. Now, not only was I average in dance ability but I was also average in height so I was right in the middle of the line. Our costumes were home made little dresses from satin lining material (oh so flammable!!) Starting from red on the left - I was to be ........ green! Suzanne, tall, leggy and blonde, was in striking red (coz she needed to be noticed that little bit more) Then sunshine yellow - all happy and shiny, Pink - every girls dream and envy (I had to stand next to her whilst looking like an offspring of Shrek! - actually Shrek hadn’t been invented then so it was more like kermit!) Vibrant purple - just like the Brazil nut in Quality Street, Orange (maybe not my second choice but at least it’s cheery!) and then cute little Melanie with her curls in a baby blue dress. Being average is not what it’s cracked up to be - it’s obviously stayed on my mind all this time! The long hot summer put most of the flowering plants into overdrive. Bloom after bloom kept coming but they would also start to go over so quickly in the heat that it was sad to see them come and go without realising their full potential! 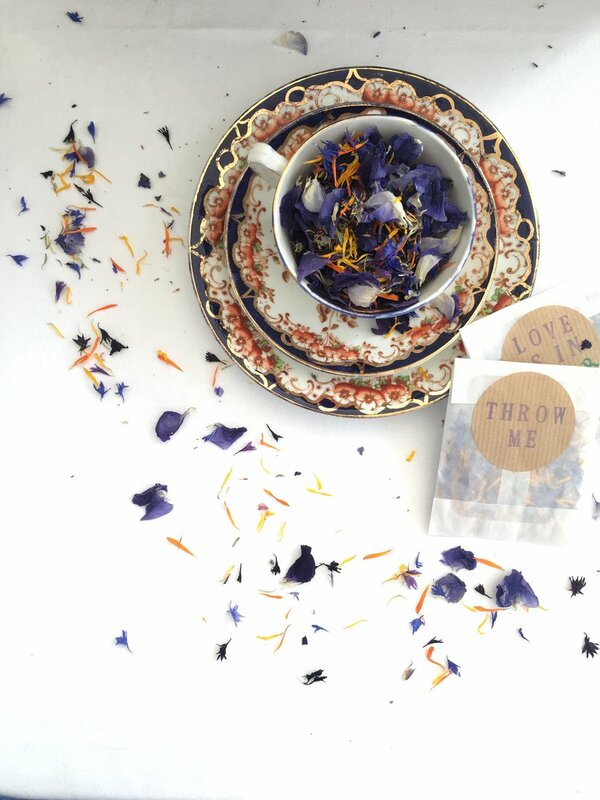 So why not capture that beauty in an everlasting way by drying the petals to make natural confetti? Home grown and hand picked, the petals were dried either in racks in the greenhouse or in a dehydrater to fully dry without losing the natural colour. Each colour way is stored separately so that they can be mixed to create different combinations. Custom mixed to match your wedding themes and colours. But the best thing about this confetti is not it’s colours but the fact it is totally 100% “green” and with no guilty conscience of the pretty littering they will leave behind. Posted on October 15, 2018 by Heather Eales and filed under Bridal, Flower Farm, Gifts, inspiration, Weddings, british flowers and tagged natural confetti biodegradable green wedding petal confetti biodegradable confetti rustic wedding boho wedding British flowers british grown.